Whatever the air conditioning requirement, a Daikin indoor unit can provide the solution. 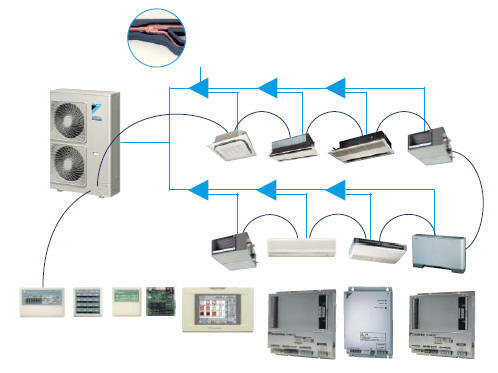 The VRVIII-S can be combined with 13 different indoor unit models in a total of 73 variations. The VRVIII-S system can be installed practically anywhere. The incorporation of a high pressure “dome” type compressor results in a remarkable outdoor operating temperature range from as low as -20°C in heating mode to as high as 46°C in cooling mode. The VRV is slimmer and more compact, resulting in significant savings in installation space. 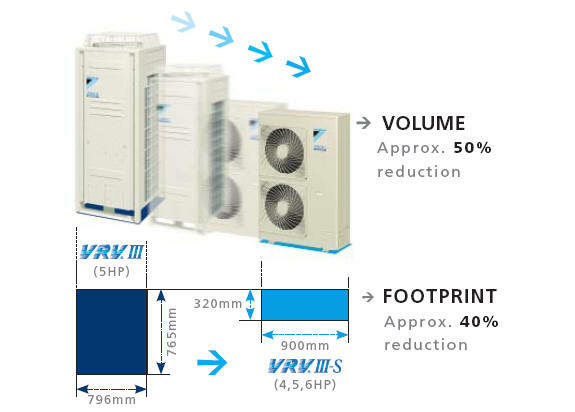 A major feature of VRVIII-S is its exceptional energy efficiency, the system achieving high COPs during both cooling and heating operation by the use of refined components and functions. 1. It enables compressor speed to vary according to the cooling/heating load and therefore consume only the power necessary to match that load. The 50 Hz frequency of the power supply is inverted to a higher or lower frequency according to the required capacity to heat or cool the room. If a lower capacity is needed, the frequency is decreased and less energy is used. 2. Under partial load conditions, the energy efficiency is higher. If the compressor rotates more slowly because less capacity is needed, the coil becomes virtually oversized. 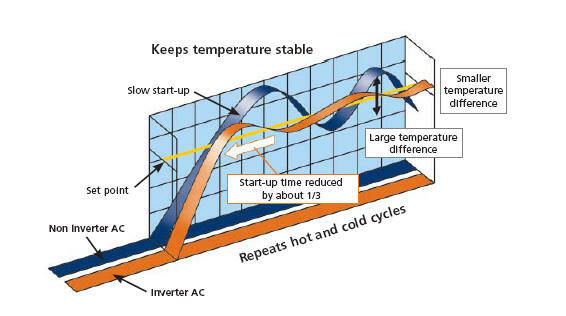 Improved efficiencies can therefore be achieved than are possible with non inverter compressors, which always run at the same speed.